Pesci, Pacino, and DeNiro in a NEW Scorsese Film?! Yes, it’s true. The greatest mob films of all time have a few things in common, and nearly all of them are in the title of this article. These legends are in talks to tell the story of the man who allegedly holds the secret to the death of Jimmy Hoffa, as well as 24 of his other victims. Frank “The Irishman” Sheeran is a mob hitman whose stories are nearly too big to capture on film – that is unless its Scorsese on the other end of the camera. 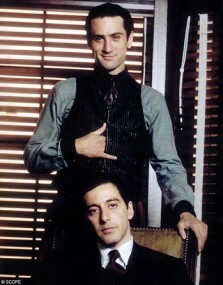 I trust Scorsese implicitly, and when I hear he is working with DeNiro I start to get giddy with excitement. The two men have helped shape each other’s careers and have created films that will forever be cherished. Combine them with Pesci and Pacino and all of the sudden you have blended up a movie that has me foaming at the mouth in anticipation. It might be asking a lot for this film to reach the heights of Goodfellas, but with a cast this strong you can rest assured that it isn’t going to be bad. And before you say the words, Righteous Kill, I’ll remind you that Scorsese is the director of this new movie – and he would never, ever do something to me like that awful Pacino/DeNiro catastrophe. This film is based on the book, I Heard You Paint Houses, written by Charles Brandt who was a trusted associate of the infamous Frank Sheeran. Watch for more news on this one, currently being called The Irishman, as it is going to be an instant classic. Dude… Righteous Kill sucked sweaty balls. I hope they are still alive when it comes out. Tell me for the love of god what was so bad, that cast was awesome Brian Dennehe, Donnie Whalberg, John Leguizamo and they were all really good. Damnit I don’t see the fault of this movie.